Snow Delay At The Airport? Blame Planes And Clouds When planes fly through certain types of clouds, they can trigger a chain reaction that causes precipitation for miles around. As rain or snow falls out of the sky, it can sometimes leave behind a visible hole in the cloud layer — a hole-punch cloud. 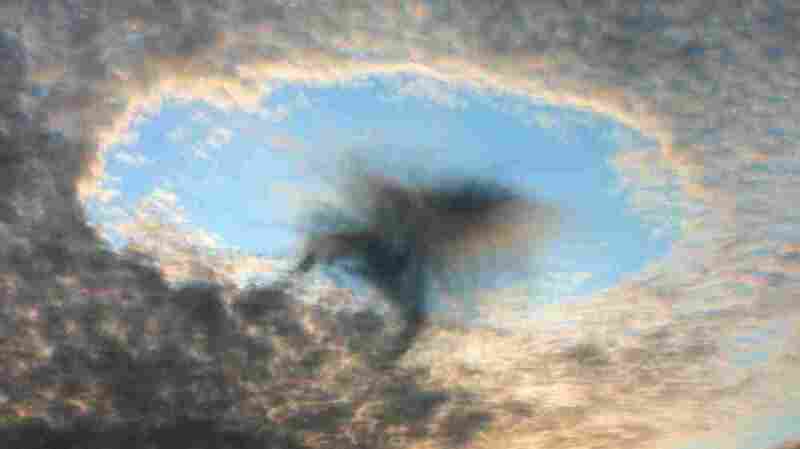 An image believed to be that of a hole-punch cloud. Scientists say airplanes create these patterns when they fly through certain types of clouds. The water in the clouds can turn to rain or snow and fall to the ground. The next time you're delayed by rain or snow at an airport, consider this: It's possible that an airplane actually caused the bad weather. When aircraft fly though certain clouds, they can trigger a chain of events that causes precipitation for miles around, according to a study in the journal Science. The idea for the study came in 2007, when a plane full of weather scientists flew through a very odd snowstorm near Denver International Airport. It looks like if you took a white sheet of paper and used a hole punch. You wonder: How the heck could something like this happen? The storm was unusual because it produced only a narrow strip of snow leading from the runway, says Andrew Heymsfield, a senior scientist at the National Center for Atmospheric Research and one of the study's authors. So the scientists did some research on the storm, Heymsfield says. And they found that the narrow band of snow they'd flown through followed the exact flight track of two turboprop aircraft that had taken off a few minutes earlier. "The quite amazing thing was that their flight track actually produced about an inch of snow at the ground," he says. The scientists were pretty sure the planes had made that snow fall, Heymsfield says. But they wanted to know precisely how. They knew that research in the 1980s had found that airplanes, especially those with propellers, could cause ice crystals to form when they flew through certain clouds at just the right temperature. So it seemed plausible that planes could trigger a little snow. And Heymsfield found evidence that they often did cause precipitation close to their flight path. But as he used satellites and airport data to study the phenomenon, he realized that a single aircraft could also cause snow to fall for miles around. 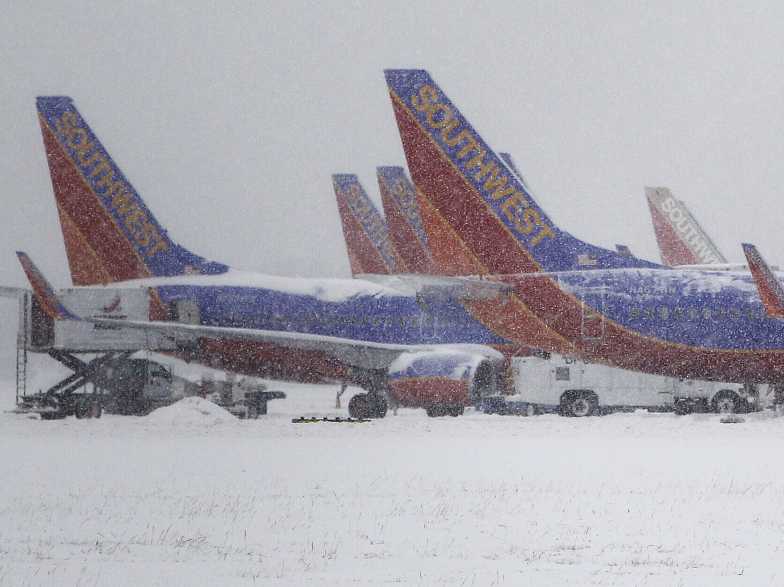 Southwest Airlines planes sit idle at Love Field in Dallas as snow continues to fall on Feb. 4. A study finds that airplanes flying through certain types of clouds can actually cause snowfall. Wingtips and propellers create ice crystals, which later fall to earth. "So the thing that piqued my interest was how the heck do you go from a little line that an aircraft makes and produce something that's many kilometers across," Heymsfield says. The team found an answer by studying something called a hole-punch cloud. From the ground, Heymsfield says, a hole-punch cloud can resemble a perfectly circular window in a cloud layer that lets you get a glimpse of the blue sky above. "Oh, they are unbelievable-looking," he says. "It looks like if you took a white sheet of paper and used a hole punch. You wonder: How the heck could something like this happen?" Now Heymsfield and his colleagues think they know. It involves an airplane flying through a very special type of cloud that contains water that's below freezing temperature, but hasn't frozen yet. When an airplane passes through the cloud, its wings and propeller cause pockets of air to expand. That expansion reduces the air temperature, pushing it below a critical point where ice crystals start to form in the cloud's "supercooled" water. Then a sort of chain reaction takes place, causing the ice crystals to radiate outward, sometimes for miles. And ultimately the crystals fall out of the sky as snow or rain, sometimes leaving behind a visible hole in the cloud layer — a hole-punch cloud. Heymsfeld says his research suggests this sort of precipitation happens surprisingly often at certain airports after airplanes take off. So could an airplane taking off actually cause a weather delay at the airport it just left? "Absolutely," Heymsfield says. Airplanes usually take off into the wind, he says, so there's a good chance that any precipitation they cause as they ascend could fall on the airport. That's bad news if your flight's canceled. But it's good news for people like Gavin Pretor-Pinney, founder of the Cloud Appreciation Society and author of The Cloudspotter's Guide. A hole-punch cloud (also known as a fallstreak hole) can be so strange-looking that people have mistaken them for flying saucers, Pretor-Pinney says. "You see photographs of them and you do think, ah there's something strange there," he says. "That's not natural." And hole-punch clouds are not natural. Like contrails, hole-punch clouds are produced by airplanes. But that doesn't make these clouds any less attractive or intriguing, Pretor-Pinney says. "Each time one understands a little bit more, one engages a little bit more with them," he says. "And for me that means one's a little bit more aware of their beauty and value."